At the Altar: Dance of the Serpents, Commissioned Installation, Mixed Media, 96 in. x 120 in. At the Altar, is a series I began in 2010, when I started creating art installations in the form of an altar. A personal altar is a dedicated space, designed and erected to celebrate or commemorate something important; an idea, a person, goal or a life intention. My yogic and artistic practices and my unfettered love for Sci-Fi have inspired a healthy interest in Kundalini energy and by extension to snakes and serpents. I am fascinated by how the snake and serpent—in physically and metaphorically— manifests in society throughout the world. They are represented, in both positive and negative ways, throughout multiple religions, cultures, and mythologies. This themed altar installation was created in honor of my ongoing dialogue with the snake or serpent energy. In this dialogue, the snake appears in three main ways: as the coiled Kundalini life force that is harnessed at the base of the spine, as the snake or serpent symbolism often used to invoke protection or as the bodily creatures that evoke fear. The foundational structure of this artwork is a spray painted recycled hammock. The hammock, the multi-layering of spray paint over the wood beams and rope, represents the structured constructs of the past and restrictive patterns of repetitive thinking. I weaved varies plastic snakes and sewed portions of recycled objects and elements through the structured columns of rope to visually convey my inner discourse. If recognized, the sewn fragments can culturally represent a global engagement for inner peace and a celebration or acknowledging specific cultural traditions. 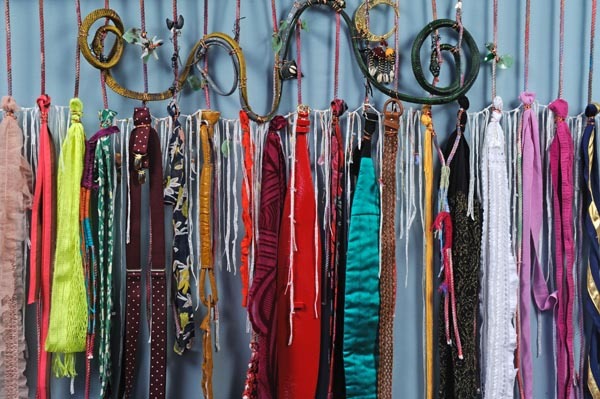 The bottom or hanging portions of each tier represents the constants that appear in my artwork and thought processes: the use of color, recycled textiles and fabric materials. This installation is essentially a public visual extension of a personal altar. My intention for this installation is to visually convey my awareness of both the positive and negative aspects of this energy and to relish in the awareness and intersection of that balance. At the Altar: Dance of the Serpents, Detail, Mixed Media, 96 in. x 120 in. For this iteration of At The Altar: Dance of the Serpents, I have surrounded that altar with a square frame of rice. Within the rice, stands the makings of an altar and prayer blanket. Depending on the time period and location within the world rice is a staple food, intricate to the rise of specific civilizations and cultural traditions. Conversely, it also has been used a tool to inflict pain as a form of punishment. Within this installation, the rice is meant to metaphysically represent the inner yet critical strife and dialogue the can occur when teaching, disciplining and quieting the mind in attempt to manage or change one’s own thoughts and or behaviors.